I'm sure the fact that Pat has major financial holdings in Liberia (wait -- $8 million is peanuts to Pat) has nothing to do with the fact that he denounced Bush for calling for their leader to step down. 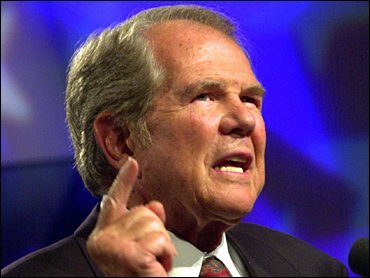 (Read CBS News | Pat Robertson Slams Bush On Liberia | July 11, 2003). Of course, there's "duly elected" of the people we like, and "duly elected" of the people we don't like. posted by emlarson @ 6:18 AM 0 comments - click here now and add your own!